Manjaro Linux is a well known Arch Linux based operating system, it is popular due to its simplicity, ease of use and support for packages. Manjaro uses pacman Package Manager and XFCE as desktop environment. It uses rolling release model which means users don’t need to reinstall the system in order to keep it up to date. 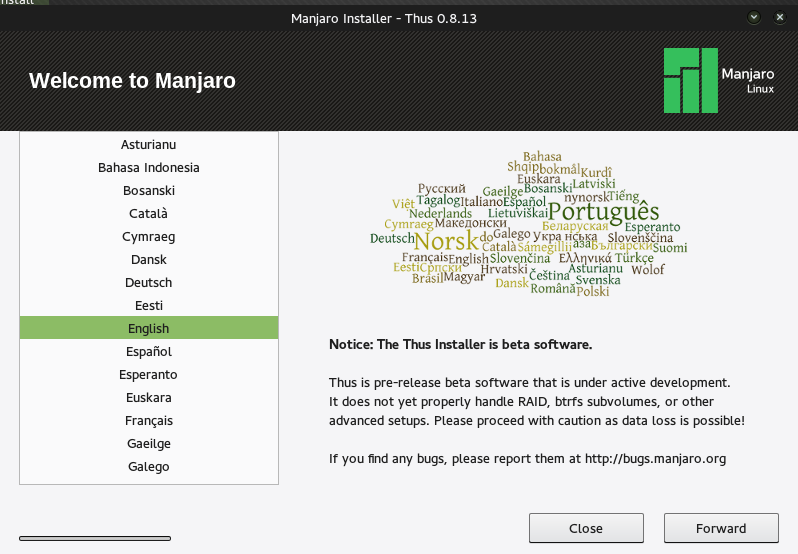 Manjaro Linux is still in beta stages and recently 0.8.13 version has been released. Keeping the stability of operating system, this release uses Linux kernel version 3.18. We will be reviewing its prominent features and installation process in this article. 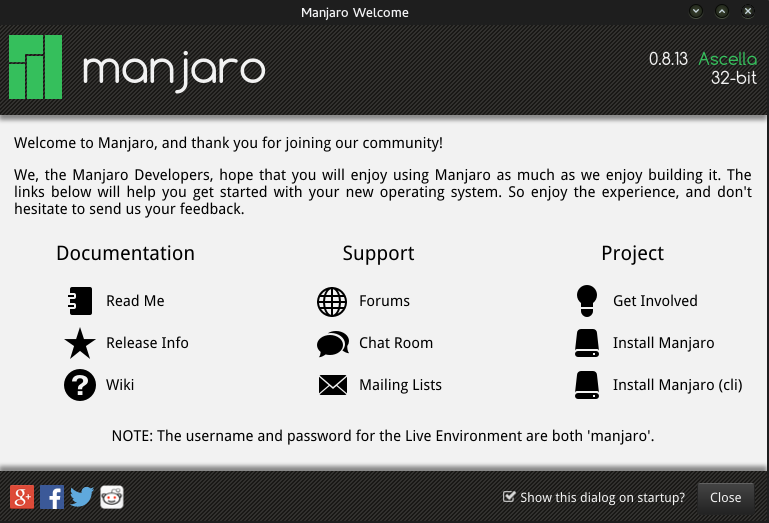 Manjaro 0.8.13 release has major improvements, bug fixes and new features. Here are some of the noteworthy features in this new beta release. One of the major improvements in Manjaro is new Xfce desktop environment. 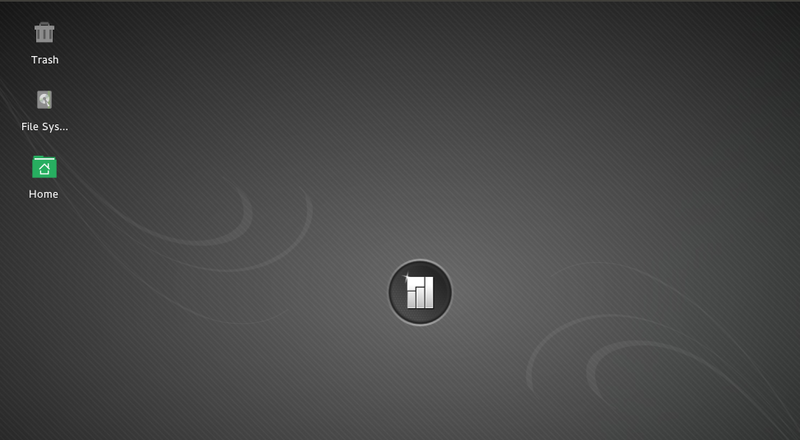 The desktop environment version 4.12 has been tweaked a lot with respect to both usability and look. New additions have been made to the installer; it can now install Manjaro to SD cards as well. Both Graphical and CLI installer are also there, the ability to install Manjaro on SD cards will let users try this wonderful operating system by keeping their Windows or other Linux operating system intact on same hardware machine. 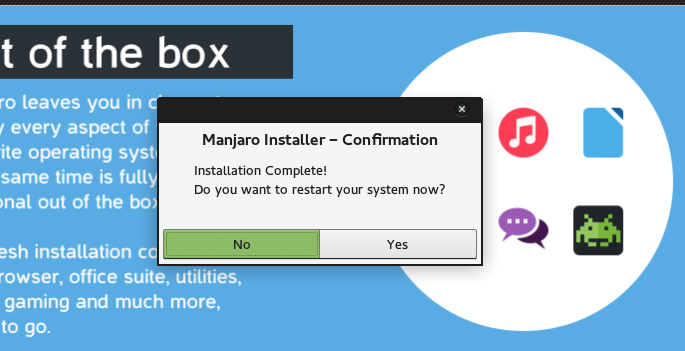 Download Manjaro new release and initiate the install process as described below. Whichever option you choose, here is the very first screen you should see when booting up your system/virtual machine from Manjaro ISO. It will start Manjaro in few seconds. It will launch desktop shortly, you should be seeing a main window on the desktop, click “Install Manjaro” from here. Choose your location from next step and click Forward to take installation to the next level. Select keyboard layout from this step and go ahead with installation. We are on the most important stage of installation now. The default partition scheme is to erase the disk and install Manjaro, this option should work if you are using Virtual Machine or stand alone system with no other operating system, or you can use second option to explicitly provide location for OS installation. 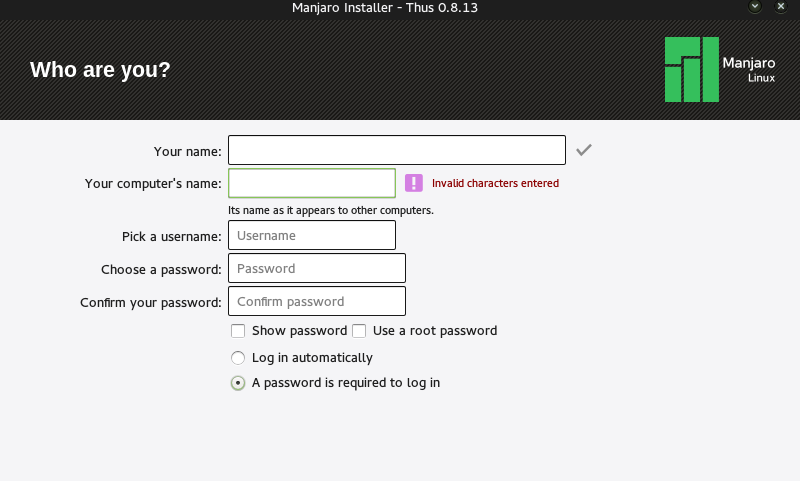 Provide your manjaro operating system username and password here. Once installation is complete, it will prompt you to reboot your system. Reboot your system and start enjoying the power of Arch Linux with simplicity of Manjaro.